The pollinating insects were in love with the flowers. The plants were alive with bee activity all day long and it would have been worth keeping the plants for that reason alone, but I was waiting for the seeds. The seeds of the cilantro plant are the spice coriander. Cilantro, or Chinese parsley, is the Spanish word for coriander and has come to mean the leaves of the plant here in the US, while coriander refers to the seeds. I ground my seeds in a coffee grinder and can produce a finer grind if I now use a mortar and pestle. The seeds are common in many ethnic cuisines including Indian where the seeds are known as dhania and are ground into a powder which is used in curries and as an ingredient in the spice mix garam masala. In other parts of the world, whole seeds are used in pickling spices, in sausage making and even in Belgian wheat beers. The flavor of the spice intensifies if the seeds are dry heated. Coriander is a really versatile spice and goes well with both sweet and savory flavors.My plants were prolific seed producers which has allowed me to grind some up and keep some seeds whole. It's going to be fun playing with this spice over the winter! Harvesting the seeds was as easy as waiting for the seeds to be completely dry and then holding the plant over a bowl and rubbing the seeds off. 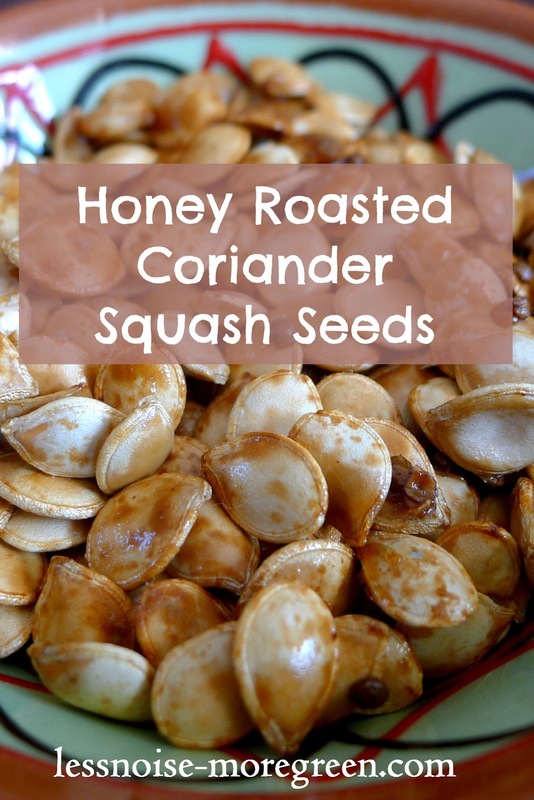 Here is a yummy seasonal coriander recipe for roasted squash seeds. Keep the seeds from your winter squash to roast as snacks! Mix together well and spread on a baking sheet. Bake for 30-35 minutes. Let cool before eating. Herbs and spices can be very expensive if you purchase them in 1oz jars from the supermarket. What's better than harvesting your own seasonings to use in your homemade meals? This is especially true of coriander which involves no skill to harvest or store and removing the seeds is actually a fun activity to do with the kids!